Despite my country western activities, and heading to the burbs twice a week for practices, I'm spending most of my time in the fair city of Toronto these days. I'm loving it here and learning to see it from a higher perspective. Wow, where were you standing at the time? 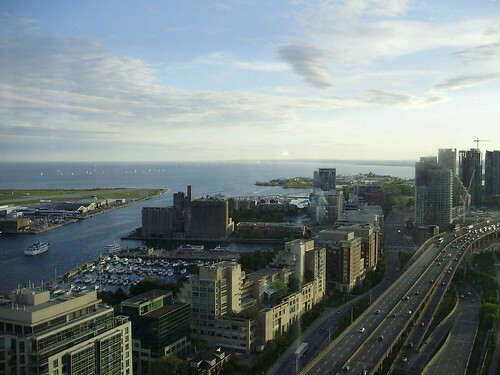 Margot was about to jump off the CN tower to end it all, when she noticed the urban panaorma with Lake Ontario and how beautiful it was. Right then angels began to sing and she knew her decision to jump was the wrong one. As she climbed back from the edge, she reached down for her camera and snapped this picture for all of us to share. Even at death’s doorstep, Margot is wholly committed to her blog. Of course, this interpretation may be completely off the mark.